FLIP is a free quiz maker app for Windows 8, which helps in creating your own interactive quizzes. You can build up quizzes related to education or anything (sports, food, general awareness, history, etc.) and later play these quizzes along with your friends. The app lets you build, edit, review, and play quizzes. Plus this app automatically shows the results at the end of each quiz. Besides this, it also shows a timer, which helps you in finding out how quickly you answered the questions. You can add as many questions in a quiz as you want. It is a great learning app for student as they can create and play quizzes and learn things faster. FLIP app is present under the Education Category in Windows Store. The app’s metro UI is pretty interesting. It is quite easy to build up different quiz decks , and add questions and answers inside them. The app lets you build the quizzes as the way you want. Either you can add questions from all topics (like history, math, geography, sports, general awareness, etc. ) inside one deck, or you can build separate decks for each. The app always opens with it’s main page. From there you can build, play , edit, review, or delete the quizzes with a single mouse click. All the buttons are self explanatory, and using them is very easy. Here are the instructions to build up a quick quiz deck. At the main screen, click on Build or Edit Quiz Button. Enter the quiz name on the Quiz Decks flyout at the left, and click on + Button. 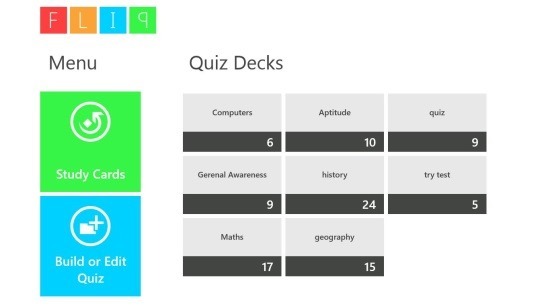 Select the quiz deck from the the Quiz Decks flyout and click on Build Button. This opens the selected quiz build/edit screen. Click on the + Button on the top right corner. Enter the desired question and its answer using specified tabs. Repeat step number 4 and 5 again to add more questions. When you are done with every thing click on Done Button. In order to play the quiz, simply select the desired quiz from the main screen and click on quiz button present on the flyout at the bottom screen. 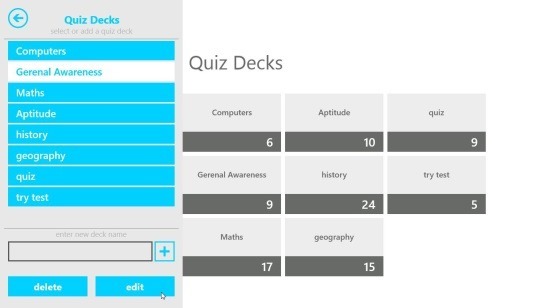 Free quiz maker app for Windows 8. Create multiple number of quizzes by adding questions and answers. Review the quiz after building it. Edit the quiz anytime when needed. Play quiz with timer enabled. View quiz results after every quiz game. FLIP is a neat quiz maker app for Windows 8. It helps you to create and play quizzes anytime, and it is a great new age medium to quickly remember stuffs that you are not able to remember. Well, there’s a limit in the number of characters in a question and you can’t use the Enter key. Still, the flexibility which it gives while creating quizzes is recommendable. Definitely a worthy app when in need and it’s all for free. Get FLIP for Windows 8 here.